You are here: Home / Blog / Tips / Get to know the Nearest Items PopUp. Get to know the Nearest Items PopUp. Every AvPlan EFB user has probably tapped on this many hundreds of times (if not thousands!). If you stop and have a look, there are many abilities tucked away here. Most, if not all users will know the golden rule about tapping the name portion for information about that place, or tapping the blue plus to add it to whatever you’re doing. You’ll also note that within the first line of the list, there is some data displayed. This is a read-out of the Lat/Long of the point at which you tapped, plus the height of the terrain and the Grid LSALT (Lowest Safe Altitude – see this previous tip for more information about them). Along the top of the menu, you will see some selections. This allows you to filter the list of results and find exactly what you’re looking for faster. There is one exception: Maps. This actually brings up a listing of all applicable maps for that point. Selecting one of these maps will set the map to that setting. Below the filter options is a switch that changes between Add or Direct To. This will only be visible when a flight plan is open – if the flight plans have been stored, a Direct To is assumed. At the bottom of Nearest Items is an easily missed feature – Add Fix. This will add a small dot with a circle around it to the map. 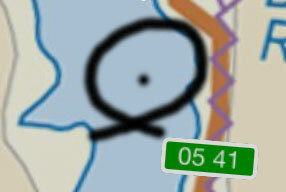 Next to that will be the UTC time – just like if you’ve logged your position on a paper map with pencil. 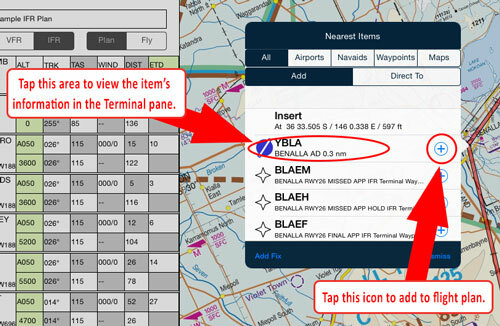 These fixes are saved with the flight plan details – plan, track log, etc. You can clear them by putting the app in Edit Mode. Have a look next time for these features. https://www.avplan-efb.com/wp/../shared/content/uploads/2015/08/Nearest-Items.jpg 178 372 Evan https://www.avplan-efb.com/wp/../shared/content/uploads/2016/10/newlogo2.png Evan2015-08-21 06:00:262015-08-19 17:11:39Get to know the Nearest Items PopUp.